No problem, just dump it in the next field! 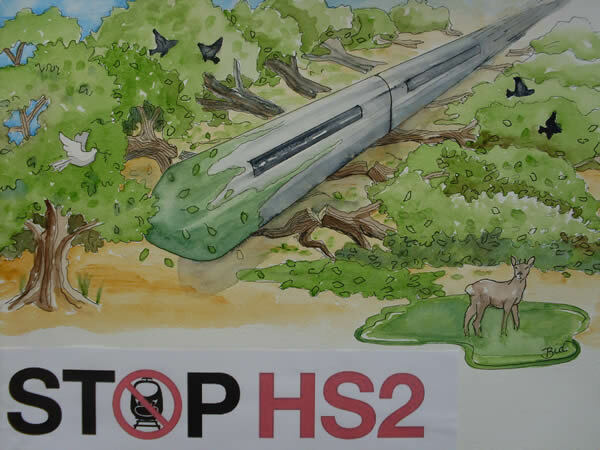 Artists impression of how HS2 trains could be used to move trees. Campaigners have been left in even more bemusement than usual at the ineptitude of the latest plan concerning HS2, the proposed High Speed Rail link. In a letter to Cheryl Gillan MP, Transport Secretary Justine Greening has set out her intentions to preserve ancient woodlands, which includes the idea of ‘transplanting woodland to an adjacent site.’ Greening also confirms that the Environmental Impact Assessment is currently underway, despite the fact that the consultation on its scope and methodology does not conclude until the end of May. "It is not possible to transplant ancient woodland successfully. You can transplant some of it but what you end up with won’t be ancient woodland. Ancient woodland is special because over millennia it has evolved its own ecosystem including soils, root fungi, etc, etc which are lost when disturbed. It is absolute nonsense to suggest that any valuable habitat can simply be trans-located by scooping it up and replanting it. I am not are of any successful example. The idea of trans-locating large trees from an ancient woodland with roots, soil, etc intact isn’t credible, and frankly not even worth debating." "When the Government start talking in all seriousness about transplanting ancient woodland, you begin to realise what they really need transplanting are some brains. Do they really think they can just carefully pick up an entire ecosystem including thousands of trees which are hundreds of years old, plonk them a few hundred yards away and that’ll be alright? You can’t just can’t just bake an ancient woodland, the clue is in the word ‘ancient’. This was supposed to be the greenest Government ever, but all they can manage is greenwash. The only green thing about HS2 is that it seems to be being run by cabbages." "The very act of disturbing such a complex ecosystem will compromise its biodiversity and thus its stability. The idea that such a intricate delicate habitat can be moved from one place to another in working order and that all of the thousands of interactions between plants and animals can resume as if nothing had happened is simplistic at best and arrogant at worst."